Santander ambassador and Olympian, Jessica Ennis-Hill, led a group of new women cyclists on Santander Cycles to highlight that 4,000 bikes have been fitted with Blaze Laserlights. Ahead of the clocks going back this weekend, The Mayor of London, Transport for London (TfL) and Santander have fitted the lights to the 4,000 Santander Cycles to make riders more visible and increase their confidence on the roads. Over the next nine months the lights will be fitted to the rest of the fleet of 11,500 bicycles. The group of women, who joined Ennis-Hill last night (25 October), were all new to cycling. The event was held to highlight that with a safer infrastructure and improved Santander Cycles they can feel more confident on the roads. Ennis-Hill said: "Cycling in London can be a great and efficient way to get around and riding Santander Cycles with the new Blaze Laserlights leading the way makes us feel confident and safe enough to get out on our bikes in the future." Blaze Laserlights project the symbol of a bicycle six metres in front of the cycle, onto the ground, making the cyclist more visible to those around them. 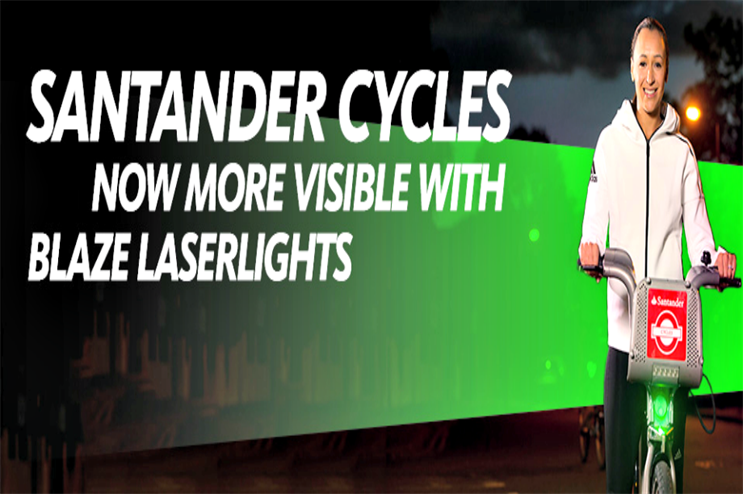 Paul Cowperthwaite, TfL’s general manager of Santander Cycles, said: "The Blaze Laserlights will make Santander Cycles even more usable in the darker mornings and evenings over winter and help to make our customers feel more confident on the roads." Keith Moor, chief marketing officer, Santander said: "We hope the introduction of Blaze Laserlights will ease the concerns of many London cyclists at this time of year. We’ve had a hugely successful trial and feel that this latest innovation from Santander Cycles will contribute to improving the lives of Londoners by reducing fear, increasing visibility and safety whilst promoting an active lifestyle."